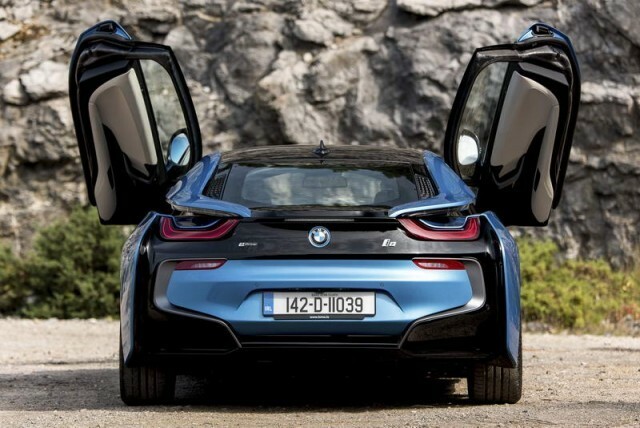 Here's the Carzone.ie used guide to the BMW i8. The outlandish BMW i8 is a sports car like no other. It has a mid-mounted, turbocharged petrol engine driving the rear wheels, eye-catching scissor doors and the sort of daring design details that make it stand out in a crowd of vehicles – even if it happens to be sitting amidst a sea of Lamborghinis and Ferraris. It was the second machine to be released under BMW’s innovative ‘i’ brand of electric and part-electric vehicles, after the full EV i3 city car, but the i8 is actually a plug-in hybrid with supplementary electric power – which is what makes it stand out in the sports car world. Realistically, the i8 has few direct rivals. Simply, in 2014 there was originally just the one model – the i8 Coupe, which came with a mid-mounted 1.5-litre three-cylinder turbocharged petrol engine driving the rear wheels, and a 131hp (96kW) permanent magnet-synchronous motor (PMSM) driving the front wheels. So clever a car is the i8 that it has two gearboxes – a six-speed automatic for the combustion engine and a two-stage reduction gear for the electric motor – while its four-wheel-drive system lacks for a mechanical link between the axles; ingenious onboard computers manage the torque split to all four wheels to maximise traction in all conditions. All of the above meant it could travel 35km on electric power alone, while its quoted economy was 134.5mpg (2.1 litres/100km) with just 49g/km of CO2 emissions – yet it could also sprint from 0-100km/h in 4.4 seconds and go on to a limited 250km/h top speed, offering the best of both worlds to buyers. In 2018, BMW uprated the PMSM to 143hp (105kW) on the Coupe and improved the lithium-ion battery, increasing the i8’s all-electric range to 55km and marginally bettering the mpg/CO2 figures; but the German company also introduced the open-topped i8 Roadster, which bolsters the showmanship factor of the car to hitherto-unseen traffic-stopping levels. The Roadster, like the 2018MY Coupe, has the uprated, latest version of the hybrid running gear. With the 105kW-motor models being extremely new, they’re still six-figure cars, even if lightly used, so you’re best off looking for an early 96kW version of the i8. But these are hugely desirable and very rare here in Ireland, so even second-hand, they won’t be anything like bargain buys. The i8 has a high level of specification as standard and not much in the way of optional extras, so there’s no need to go searching out special models to get the best experience from this plug-in hybrid sports car. As a slice of futuristic motoring that is free from the perils of range anxiety – thanks to its part-petrol-powered drivetrain – and which is also guaranteed to turn all heads in its immediate vicinity, there is little else like the BMW i8 on the planet. While great fun to drive and a real experience to travel in, the i8 isn’t quite BMW’s finest-handling product, but it’s still an incredible tour de force of cutting-edge technology and easy, daily usability. Charge it regularly and it will also be cheaper to run than a diesel supermini – but bear in mind that ownership of a BMW i8 does not come cheap, even when buying four-year-old examples.